A delightfully easy sweet treat that’s make ahead friendly for when your sweet tooth strikes! Double-boiler method: place the chocolate in a medium-sized glass bowl that can rest on top of a pot without falling in. Fill the pot with a couple inches of water, place the bowl of chocolate over top, and bring the water to a boil. Use a spatula to constantly stir the chocolate until it’s melted and smooth. Microwave method: place the chocolate in a medium-sized glass bowl and microwave it in 20-second increments, stirring well between each spell, until it’s melted and smooth. 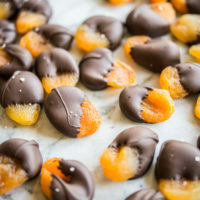 Dip the apricots halfway into the dark chocolate, then place on the parchment paper and sprinkle with sea salt. Let sit for 30 minutes, or until chocolate has hardened, then store in the refrigerator.